Ferit Orhan Pamuk (born on June 7, 1952 in Istanbul) generally known simply as Orhan Pamuk, is a Nobel Prize-winning Turkish novelist and professor of comparative literature at Columbia University. Pamuk is one of Turkey's most prominent novelists, and his work has been translated into more than fifty languages. He is the recipient of numerous national and international literary awards. He was awarded the Nobel Prize in Literature on October 12, 2006, becoming the first Turkish person to receive a Nobel Prize. Pamuk has been persecuted and prosecuted for his criticism of some episodes in the Turkish past, including genocide against the Kurds and Armenians. At the same time he has been critical of Western arrogance over their achievements, such as the Enlightenment and Modernism. Pamuk has sought to bridge the cultural difference between traditional society and modernity. Pamuk was born in Istanbul in 1952 and grew up in a wealthy yet declining bourgeois family, an experience he describes in passing in his novels The Black Book and Cevdet Bey and His Sons, as well as more thoroughly in his personal memoir Istanbul. He was educated at Robert College prep school in Istanbul and went on to study architecture at the Istanbul Technical University. He left the architecture school after three years, however, to become a full-time writer, graduating from the Institute of Journalism at the University of Istanbul in 1976. From ages 22 to 30, Pamuk lived with his mother, writing his first novel and attempting to find a publisher. On March 1, 1982, Pamuk married Aylin Turegen, a historian. From 1985 to 1988, while his wife was a graduate student at Columbia University, Pamuk assumed the position of visiting scholar there, using the time to conduct research and write his novel The Black Book in the university's Butler Library. This period also included a visiting fellowship at the University of Iowa. Pamuk returned to Istanbul. He and his wife had a daughter named Rüya born in 1991, whose name means "dream" in Turkish. In 2001, he and Aylin were divorced. In 2006, after a period in which criminal charges had been pressed against him for his outspoken comments on the Armenian Genocide, Pamuk returned to the US to take up a position as a visiting professor at Columbia. Pamuk is currently a Fellow with Columbia's Committee on Global Thought and holds an appointment in Columbia's Middle East and Asian Languages and Cultures department and at its School of the Arts. Pamuk was a writer in residence at Bard College (2004, 2007). In May 2007 Pamuk was among the jury members at the Cannes Film Festival headed by British director Stephen Frears. In the 2007-2008 academic year Pamuk returned to Columbia once again to jointly teach comparative literature classes with Andreas Huyssen and David Damrosch. He completed his next novel, Masumiyet Müzesi (The Museum of Innocence) in the summer of 2007 in Portofino, Italy. It was released in January of 2008 in Turkey. The German translation will appear shortly before the 2008 Frankfurt Book Fair where Pamuk was planning to hold an actual Museum of Innocence consisting of everyday odds and ends the writer has amassed (the exhibition will instead occur in an Istanbul house purchased by Pamuk). Plans for an English translation have not been made public, but Erdağ Göknar received a 2004 NEA grant for the project. His older brother is Şevket Pamuk—who sometimes appears as a fictional character in Orhan Pamuk's work—an acclaimed professor of history, internationally recognized for his work in history of economics of the Ottoman Empire, while working at Bogazici University in Istanbul. Orhan Pamuk started writing regularly in 1974. His first novel, Karanlık ve Işık (Darkness and Light) was a co-winner of the 1979 Milliyet Press Novel Contest (Mehmet Eroğlu (* tr) was the other winner). This novel was published with the title Cevdet Bey ve Oğulları (Mr. Cevdet and His Sons) in 1982, and won the Orhan Kemal Novel Prize in 1983. It tells the story of three generations of a wealthy Istanbul family living in Nişantaşı, the district of Istanbul where Pamuk grew up. Pamuk won a number of critical prizes for his early work, including the 1984 Madarali Novel Prize for his second novel Sessiz Ev (The Silent House) and the 1991 Prix de la Découverte Européenne for the French translation of this novel. His historical novel Beyaz Kale (The White Castle), published in Turkish in 1985, won the 1990 Independent Award for Foreign Fiction and extended his reputation abroad. The New York Times Book Review announced, "A new star has risen in the east–Orhan Pamuk." He started experimenting with postmodern techniques in his novels, a change from the strict naturalism of his early works. Popular success took a bit longer to come to Pamuk, but his 1990 novel Kara Kitap (The Black Book) became one of the most controversial and popular readings in Turkish literature, due to its complexity and richness. In 1992, he wrote the screenplay for the movie Gizli Yüz (Secret Face), based on Kara Kitap and directed by a prominent Turkish director, Ömer Kavur. Pamuk's fourth novel Yeni Hayat (New Life) (1995), caused a sensation in Turkey upon its publication and became the fastest-selling book in Turkish history. By this time, Pamuk had also become a high-profile figure in Turkey, due to his support for Kurdish political rights. In 1995, Pamuk was among a group of authors tried for writing essays that criticized Turkey's treatment of the Kurds. In 1999, Pamuk published his story book Öteki Renkler (The Other Colors). Pamuk's international reputation continued to increase when he published Benim Adım Kırmızı (My Name is Red) in 2000. The novel blends mystery, romance, and philosophical puzzles in a setting of 16th century Istanbul. It opens a window into the reign of Ottoman Sultan Murat III in nine snowy winter days of 1591, inviting the reader to experience the tension between East and West from a breathlessly urgent perspective. My Name Is Red has been translated into 24 languages and won the lucrative IMPAC Dublin Award in 2003. Pamuk's most recent novel is Kar in 2002 (English translation, Snow, 2004), which explores the conflict between Islamism and Westernism in modern Turkey. The New York Times listed Snow as one of its Ten Best Books of 2004. He also published a memoir/travelogue İstanbul—Hatıralar ve Şehir in 2003 (English version, Istanbul—Memories and the City, 2005). Pamuk's Other Colors—a collection of non-fiction and a story—was published in the UK in September 2007. His next novel is titled The Museum of Innocence. In 2005 Orhan Pamuk received the €25,000 Peace Prize of the German Book Trade for his literary work, in which "Europe and Islamic Turkey find a place for one another." The award presentation was held at Paul's Church, Frankfurt. Pamuk's books are characterized by a confusion or loss of identity brought on in part by the conflict between European and Islamic, or more generally Western and Eastern values. They are often disturbing or unsettling, but include complex, intriguing plots and characters of great depth. His works are also redolent with discussion of and fascination with the creative arts, such as literature and painting. Pamuk's work often touches on the deep-rooted tensions not only between East and West but between traditionalism and modernism/secularism. On October 12, 2006, the Swedish Academy announced that Orhan Pamuk had been awarded the 2006 Nobel Prize in literature for Istanbul, confounding pundits and oddsmakers who had made Syrian poet Ali Ahmad Said, known as Adunis, a favorite. In its citation, the Academy noted: "In the quest for the melancholic soul of his native city, [Pamuk] has discovered new symbols for the clash and interlacing of cultures." Orhan Pamuk held his Nobel Lecture December 7, 2006, at the Swedish Academy, Stockholm. The lecture was entitled "Babamın Bavulu" (My Father's Suitcase) and was given in Turkish. In the lecture he viewed the relations between Eastern and Western Civilizations in an allegorical upper text which covers his relationship with his father. In 2005, after Pamuk made a statement regarding the mass killings of Armenians and Kurds in the Ottoman Empire, a criminal case was opened against the author based on a complaint filed by ultra-nationalist lawyer, Kemal Kerinçsiz. The charges were dropped on 22 January, 2006. Pamuk has subsequently stated his intent was to draw attention to freedom of expression concerns. The criminal charges against Pamuk resulted from remarks he made during an interview in February 2005 with the Swiss publication Das Magazin, a weekly supplement to a number of Swiss daily newspapers: the Tages-Anzeiger, the Basler Zeitung, the Berner Zeitung and the Solothurner Tagblatt. In the interview, Pamuk stated, "Thirty thousand Kurds, and a million Armenians were killed in these lands and nobody dares to talk about it." Pamuk has said that after the Swiss interview was published, he was subjected to a hate campaign that forced him to flee the country. He returned later in 2005, however, to face the charges against him. In an interview with CNN TURK, he said that in his speech he used passive voice, and he did not give numbers like thirty thousand or one million. In an interview with BBC News, he said that he wanted to defend freedom of speech, which was Turkey's only hope for coming to terms with its history: "What happened to the Ottoman Armenians in 1915 was a major thing that was hidden from the Turkish nation; it was a taboo. But we have to be able to talk about the past." In June 2005, Turkey introduced a new penal code including Article 301, which states: "A person who, being a Turk, explicitly insults the Republic or Turkish Grand National Assembly, shall be punishable by imprisonment of between six months to three years." Pamuk was retroactively charged with violating this law in the interview he had given four months earlier. In October, after the prosecution had begun, Pamuk reiterated his views in a speech given during an award ceremony in Germany: "I repeat, I said loud and clear that one million Armenians and thirty thousand Kurds were killed in Turkey." Because Pamuk was charged under an ex post facto law, Turkish law required that his prosecution be approved by the Ministry of Justice. A few minutes after Pamuk's trial started on 16 December, the judge found that this approval had not yet been received and suspended the proceedings. In an interview published in the Akşam newspaper the same day, Justice Minister Cemil Çiçek said he had not yet received Pamuk's file but would study it thoroughly once it came. On December 29, 2005, Turkish state prosecutors dropped the charge that Pamuk insulted Turkey's armed forces, although the charge of "insulting Turkishness" remained. The charges against Pamuk caused an international outcry and led to questions in some circles about Turkey's proposed entry into the European Union. On 30 November, the European Parliament announced that it would send a delegation of five MEPs, led by Camiel Eurlings, to observe the trial. EU Enlargement Commissioner Olli Rehn subsequently stated that the Pamuk case would be a "litmus test" of Turkey's commitment to the EU's membership criteria. On December 1, Amnesty International released a statement calling for Article 301 to be repealed and for Pamuk and six other people awaiting trial under the act to be freed. PEN American Center also denounced the charges against Pamuk, stating: "PEN finds it extraordinary that a state that has ratified both the United Nations International Covenant on Civil and Political Rights, and the European Convention on Human Rights, both of which see freedom of expression as central, should have a Penal Code that includes a clause that is so clearly contrary to these very same principles." On December 13, eight world-renowned authors—José Saramago, Gabriel García Márquez, Günter Grass, Umberto Eco, Carlos Fuentes, Juan Goytisolo, John Updike and Mario Vargas Llosa—issued a joint statement supporting Pamuk and decrying the charges against him as a violation of human rights. In a review of Snow in The Atlantic, Christopher Hitchens complained that "from reading Snow one might easily conclude that all the Armenians of Anatolia had decided for some reason to pick up and depart en masse, leaving their ancestral properties for tourists to gawk at." However, John Updike, reviewing the same book in The New Yorker, wrote: "To produce a major work so frankly troubled and provocatively bemused and, against the grain of the author’s usual antiquarian bent, entirely contemporary in its setting and subjects, took the courage that art sometimes visits upon even its most detached practitioners." On January 22, 2006, the Justice Ministry refused to issue an approval of the prosecution, saying that they had no authority to open a case against Pamuk under the new penal code. With the trial in the local court, it was ruled the next day that the case could not continue without Justice Ministry approval. Pamuk's lawyer, Haluk İnanıcı, subsequently confirmed that charges had been dropped. The announcement occurred in a week when the EU was scheduled to begin a review of the Turkish justice system. EU enlargement commissioner Olli Rehn welcomed the dropping of charges, saying 'This is obviously good news for Mr. Pamuk, but it's also good news for freedom of expression in Turkey.' However, some EU representatives expressed disappointment that the justice ministry had rejected the prosecution on a technicality rather than on principle. Reuters quoted an unnamed diplomat as saying, "It is good the case has apparently been dropped, but the justice ministry never took a clear position or gave any sign of trying to defend Pamuk." Meanwhile, the lawyer who had led the effort to try Pamuk, Kemal Kerinçsiz, said he would appeal the decision, saying, "Orhan Pamuk must be punished for insulting Turkey and Turkishness, it is a grave crime and it should not be left unpunished." Pamuk and his book remain controversial. He has been lauded in the West, and vilified by some at home. On April 25, 2006, (in print in the May 8, 2006 issue) the magazine [[TIME (magazine)|TIME] listed Orhan Pamuk in the cover article "TIME 100: The People Who Shape Our World," in the category "Heroes & Pioneers," for speaking up. 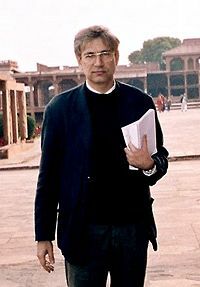 In April 2006, on the BBC's Hardtalk program, Pamuk stated that his remarks regarding the Armenian massacres were meant to draw attention to freedom of expression issues in Turkey rather than to the massacres themselves. On December 19-20, 2006 a symposium on Orhan Pamuk and His Work was held at Sabancı University, Istanbul. Pamuk himself gave the closing address. In January 2008, 13 ultranationalists, including Kemal Kerinçsiz, were arrested by Turkish authorities for participating in a Turkish nationalist underground organization, named Ergenekon, allegedly conspiring to assassinate political figures, including several Christian missionaries and Armenian intellectual Hrant Dink. Several reports suggest that Orhan Pamuk was among the figures this group plotted to kill. All links Retrieved July 20, 2008. ↑ ORHAN PAMUK CANCELS “MUSEUM OF INNOCENCE”. "Art Forum"
↑ Joy E. Stocke, "The Melancholy Life of Orhan Pamuk", Wild River Review, November 19, 2007. ↑ "Kerinçsiz puts patriotism before free speech, EU". Turkish Daily News, July 21, 2006. ↑ Author's trial set to test Turkey, BBC News. ↑ Writer repeats Turk deaths claim, BBC News. ↑ Turk writer's insult trial halted, BBC News. ↑ Partial reprieve for Turk writer, BBC News. ↑ Camiel Eurlings MEP leads delegation to observe trial of Orhan Pamuk, EEP-ED. ↑ PEN Protests Charges Against Turkish Author Orhan Pamuk, PEN American Center. ↑ John Updike, "Anatolian Arabesques: A modernist novel of contemporary Turkey," The New Yorker, August 30, 2004. ↑ Pamuk Case Dropped as Minister Says 'I have no Authorization for Permission' The ministry left the decision of whether to proceed , Zaman. ↑ Orhan Pamuk: Teller of the Awful Truth, TTME.com. ↑ Hardtalk in Turkey: Orhan Pamuk, BBC News. ↑ Tavernise, Sabrina. 13 Arrested in Push to Stifle Turkish Ultranationalists Suspected in Political Killings. The New York Times. January 28, 2008. ↑ Lea, Richard. 'Plot to kill' Nobel laureate. The Guardian. January 28, 2008. ↑ Tilburg University honours Michael Ignatieff, Orhan Pamuk and Robert Sternberg with doctorates  nuffic. This page was last modified on 3 January 2019, at 22:16.